The murderer dubbed the Phantom of Heilbronn had been baffling German investigators for two years. The criminal was a rarity, a female serial killer, and a very busy one: police had linked DNA evidence from 40 crimes  including the infamous homicide of a policewoman in the southern German town of Heilbronn  to the same woman. The police thought they'd been looking everywhere. But it turns out they should have been looking down  at the cotton swabs they were using to collect DNA samples. On March 26, German police revealed that the cotton swabs they use may have all been contaminated by the same worker at a factory in Austria  and that the Phantom of Heilbronn never existed. 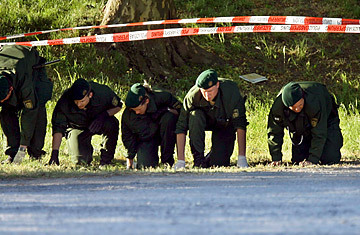 For the second time in a week, DNA evidence has led German police down a dead end. "Are the heads of our police stuffed with cotton wool?" asked a headline in this week's Bild newspaper. The Phantom is now considered the most embarrassing lapse in German DNA analysis yet. But as they studied the evidence, contradictions emerged that possibly should have raised red flags. The Phantom was not only a brutal killer  suspected of committing six homicides  but also a common thief. She had been involved in a car-dealership robbery and a school break-in, but in both cases others convicted of those crimes denied her existence. The Phantom's list of accomplices showed no pattern, ranging from Slovaks to Serbs, Albanians to Romanians, and her territory stretched throughout Germany and into Austria and France. No one had ever seen her, no security camera had ever captured her image. But when witnesses described her, they sometimes said she looked like a man. It wasn't until earlier this year that investigators figured something had to be very wrong. Trying to establish the identity of a burned corpse found in 2002, they were re-examining the fingerprints of a male asylum seeker taken from his asylum application made many years earlier. The fingerprints contained the Phantom's female DNA. Impossible, they thought, so they repeated the test with a different cotton swab  and this time found no trace of the Phantom's DNA. Earlier this year, Austrian authorities began decommissioning all cotton swabs manufactured by Austrian company Greiner Bio-One International AG after they had made a similar discovery, with a different mysterious DNA donor. On Thursday, several German states admitted to using that same brand of cotton swab. An investigator from the state of Baden-Württemberg told Bild newspaper: "The things were double-packaged; we thought they were the Mercedes of cotton swabs." But the Austrian manufacturer hurried to declare Thursday night that "Greiner Bio-One cotton swabs are not certified for DNA analysis." Berlin police spokesman Michael Merkle tells TIME that the city's investigators are now checking whether they also use cotton swabs from Greiner Bio-One. "A consequence of the present case may be to start randomly checking the cotton swabs we are supplied with for traces of DNA  which, in turn, harbors the risk of contaminating them," he says. And the case isn't closed yet. Germany's Federal Criminal Police Office is investigating the theory that certain batches of cotton swabs could have been contaminated at some point in their production, from when the raw cotton was picked to when the swabs were packed. Forensic analysts in Stuttgart have been testing unused cotton swabs for the Phantom's DNA but say that so far they have found no evidence of contamination. For the German police, it would be a relief to discover that the mysterious female serial killer doesn't actually exist. But it would also be a bitter confirmation of the thousands of man-hours wasted chasing a ghost  and of the 40 criminal investigations that are now back to square one. Read: "Despite DNA Evidence, Twins Charged in Heist Go Free."